Development of Mars 2020 remains on schedule despite uncertainty about when future phases of the overall Mars sample return effort will launch. WASHINGTON — With few new missions in development, NASA's Mars Exploration Program is shifting towards operations of ongoing missions as well as technology development to support an eventual sample return effort. 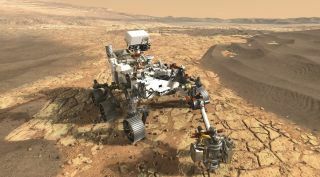 NASA's fiscal year 2019 budget proposal requests $601.5 million for the program, which includes several missions currently in operation and the Mars 2020 rover under development. That figure is down from the $647 million it received in fiscal year 2017, reflecting the progress on Mars 2020. Mars 2020, the only other Mars spacecraft in development, accounts for $348 million of the $601.5 million in the request. The project is set to undergo a system integration review the week of Feb. 26, said Jim Watzin, director of the Mars Exploration Program at NASA Headquarters, at a Feb. 20 meeting of the Mars Exploration Program Analysis Group (MEPAG). That review keeps the mission on schedule for a July 2020 launch. Mars 2020 is designed to cache Martian rock and regolith samples for later return to Earth. The agency, though, has yet to formally start development of the missions that would follow Mars 2020 to retrieve the samples from the Martian surface and return them to Earth. The budget proposal includes a line for "Mars Future Missions" with a request for $50 million in 2019. The funding is earmarked to support work on key technologies needed for any future sample return missions . "One of the highlights in the planetary science budget was the addition of planning for a potential Mars sample return mission," Watzin said at the MEPAG meeting. "This is really great news for us to begin taking a serious look at this." NASA unveiled a general architecture for what it calls "lean sample return" in August 2017. That calls for the launch of a lander and rover to collect the samples cached by Mars 2020 and place them into a container that would be launched into orbit by an ascent vehicle. An orbiter would rendezvous with and grab that container and return it to Earth. Many of the details of how those missions would be developed, and even their requirements, are still under study. "Fundamentally, we're going to have to maintain some flexibility in our requirements for the mission," Watzin said. "We may not be able to do everything that everyone wanted on that particular mission, and we will be trading cost and risk and performance as an essential part of the trade space as we look at this." Technology development work is already in progress, he said, to address key issues associated with both the sample retrieval lander and sample collection orbiter. A particular focus has been on the technologies needed for the Mars ascent vehicle rocket and the ability of the orbiter to rendezvous with the sample canister launched by that rocket. Those efforts have made some progress, Chad Edwards of the Mars Exploration Program said at the MEPAG meeting. That includes a decision on the design of the ascent vehicle, which will be a single-stage rocket using hybrid propulsion, a paraffin-based solid fuel known as SP7 along with mixed oxides of nitrogen liquid oxidizer. That vehicle would be able to place a sample container weighing 12 kilograms into a 350-kilometer orbit around the planet. Other work includes studying whether to use electric or chemical propulsion to maneuver to rendezvous with the sample canister. "This becomes a trade between mass and time," he said, with electric propulsion offering lower mass versus the shorter maneuvering times chemical propulsion can provide. "All of these technologies are on track to support a launch of the sample retrieval lander and sample return orbiter as early as 2026," Edwards said. However, the administration's budget proposal does not commit to a specific date for launching those missions. The budget projections included in the proposal keep the future missions line at $50 million a year through 2023, almost certainly insufficient to support development of spacecraft whose combined cost is likely to be well above a billion dollars. Jim Green, director of NASA's planetary science division, said at the Planetary Science Advisory Committee meeting Feb. 21 said future funding would depend on how the Mars sample return architecture takes shape, including potential roles by commercial and international partners. "Without a go-forward architecture for which we can actually get a rudimentary budget, money is not just be given to us to have it lay around," he said. "We have a lot of work to do to be able to scope out what elements of the program are going to be executed, and who's going to do what, before we can create a budget." A proposed Mars helicopter has made technical progress, but NASA has not made a decision yet on including it on the Mars 2020 mission. The remainder of the Mars Exploration Program budget goes to support ongoing missions, development of an instrument that will fly on the European Space Agency's ExoMars 2020 lander, and other science and technology work. "All of our missions are healthy, but many of them are getting long in the tooth," Watzin said at a Feb. 22 meeting of the Planetary Science Advisory Committee. The youngest, the Mars Atmosphere and Volatile EvolutioN (MAVEN) orbiter, has been at Mars since September 2014. The oldest, the Mars Odyssey orbiter, arrived at Mars in October 2001. Those spacecraft, while healthy, are not without their problems. Engineers have been working for about a year on problems with the drill on the Curiosity rover, ultimately developing an alternative way to use the drill to work around those problems. The first operation of the drill using that alternative technique should take place within days, he said. The Mars Reconnaissance Orbiter (MRO), which has been in orbit for nearly 12 years, recently suffered a voltage problem with its batteries that put the spacecraft into a standby mode for several days. That kept it from performing observations or serving as a communications relay for the Curiosity and Opportunity rovers. The importance of MRO, and its age, led NASA to study concepts for a Mars orbiter mission that could launch in 2022 to take over MRO's imaging and communications roles, but those plans are no longer being pursued. "We have healthy fuel reserves on board, so now the challenge before us is to see how long we can extend the life and usefulness of this mission," Watzin said of MRO. NASA is moving ahead with plans to alter the orbit of the MAVEN orbiter to have it serve as a communications relay. Watzin said the spacecraft, now in its extended mission, will lower the apoapsis, or most distant point, of the spacecraft's orbit in 2019 from its current 6,200 kilometers to 4,000 to 4,500 kilometers. That lower orbit will put MAVEN into a better position to be a relay while allowing it to continue its science mission. While large missions beyond Mars 2020 are not under consideration other than future sample return missions, Mars smallsat missions are being studied. Watzin described at the MEPAG meeting one concept called Mars Micro Orbiter under development by a team led by Mike Malin of Malin Space Science Systems. The spacecraft is a 12-unit cubesat that would launch as a secondary payload and use onboard propulsion to travel to and enter orbit around Mars to perform global environmental monitoring. The mission will undergo a preliminary design review in March, he said, although he didn't discuss its status beyond that. Another concept under development over the last several years is a small helicopter that could fly on a rover mission like Mars 2020, serving as an aerial scout. Tests of the concept, including flying it in a chamber at Mars atmospheric conditions, have been promising, Watzin said. NASA has not made a decision to include it on Mars 2020, though. "There's certainly a chance," he said at the MEPAG meeting when asked if it could fly on that mission. A decision would likely come in a month or two, he added. Green said the decision to add the helicopter to Mars 2020 will depend on both its technical progress and "an adequate budget" to complete its development. "It's going through its reviews. So far, it's doing well," he said. "It has a ways to go."